This is a guided meditation to invoke the presence of the Asceleottyi council and experience their unique energy vibration. Though I go by the name of Spirit Guide Sparrow, the Asceleottyi group, of whom I am a part, know me by a different name. This is a name that represents my energy vibration and gifts of spirit associated with this soul group. Everyone has their own soul group, and perhaps one day you too will connect with your own and discover your own true identity and spirit ancestry. Some of you may be able to connect with the Asceleottyi soul group by visiting their halls of records. This short meditation is an alternative form of intimate connection with us on our energy frequency. Some may find this meditation unusual, but it is appropriate for the platform to support the energy coming through. I will take you to a corridor of light upon a highway of consciousness. Within this corridor you will be in a state and space suitable for those of the Asceleottyi beings to approach you. It is necessary for you not to visualise or fixate on any Earth-orientated surroundings since this will completely throw you off where you need to be to meet the Asceleottyi. Before using my meditations you may wish to follow your own routine to relax you for the journey ahead. When you have set aside enough time and space for your session you will want to ensure you will not be interrupted for at least thirty minutes. You will want to initiate a comfortable position and prepare your physical space to your needs. You may also wish to play some subtle background music to aid in your relaxation. This type of music can be found in most spiritual/new age stores, as well as most CD retailers. You may also find suitable music online. Natural harmonious music is preferred because you will want it to raise your energy vibration. Space or aquatic music is more appropriate for this particular meditation. Begin your personal routine of relaxation and enter your state of deep inner awareness. If you do not have a personal routine of relaxation seek guidance from meditation practitioners for one best suited for you. If you so wish, you may want to begin your meditation journey with a simple ten-minute chakra exercise. This may maximise your energy flow and boost the efficiency of your third eye and receptive nodes. (Not my own) Guided chakra meditation. Video suitable for all ages. Bring the breath into focus and allow it to bring your mind, body and spirit into harmonious alignment. It is very important for a successful meditation that you aspire to this alignment. Use the breath to calm the mind into gentle stillness. Breathe in the universal life force that surrounds, penetrates and enlightens you. Breathe out all emotional, mental and physical attachments and negative energy residue. Within the breath you may wish to state clearly your intent and reason for your meditation at this time. Sit ideally with your spine straight and the palms of your hands facing upward. Allow your mind now to shift its focus to the temple of your forehead. And at the temple of your forehead imagine a pinhead of silvery-white light. As you do, sense a warmth of energy forming within the light. Imagine this light slowly becoming bigger and bigger, radiating a brilliant silvery-white light, until it is the size of a tennis ball. As it shimmers upon your forehead shift your focus to the palms of your hands. Within the palms of your hands imagine a pinhead of silvery-white light. Sense the warmth radiating through your hands as the light grows bigger, and bigger. Imagine the silvery-white light form two shimmering balls of energy in the palms of your hands. Feel the warm glow of your hands, and upon your forehead, and feel the energy spinning in unison. From the glow upon your forehead two silvery-white beams of light begin to shoot down to connect with the light within your left and your right hands. Imagine now a third beam of silvery-white light ignites between your left and right hands, forming a triangular beam of light, between your hands and forehead. As soon as this happens you begin to notice a triangular prism of silvery-white light form from your temple, to your hands, permeating throughout your whole upper body. As you do this, begin to will the holographic prism into a slow spinning rotation. As you observe it, will it faster and faster into rotation. 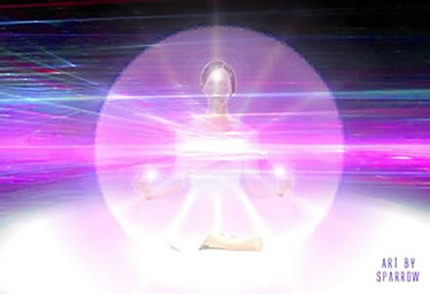 As it begins to spin faster and faster imagine another radiant light begin to emerge within the prism, formed from the pure love of your spirit. Observe the love of your pure spirit radiate more and more within the prism until it fills it entirely. As this pure love builds and builds within the prism to a radiant glow, suddenly observe a fractured ray of violet light project out from the prism. As the prism continues to spin, see this ray of violet light spin around and around you, completely surrounding you, forming a type of plasma ball. Observe the plasmic sphere engulf you in beautiful violet light and silvery-white flakes of light. 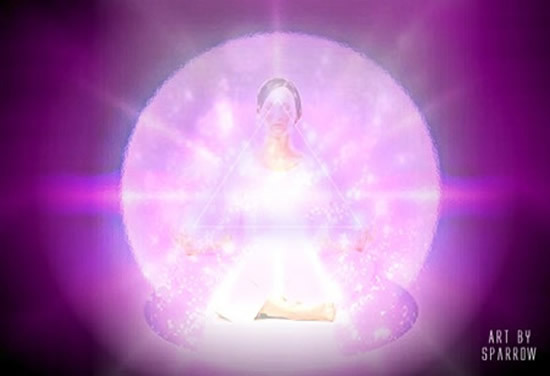 As this plasmic sphere of violet light solidifies around you, cocooning you within its energy, notice how the prism spins out of your current scope of vision and disappears. It is no longer necessary to give the prism momentum as it now has its own to sustain the sphere. 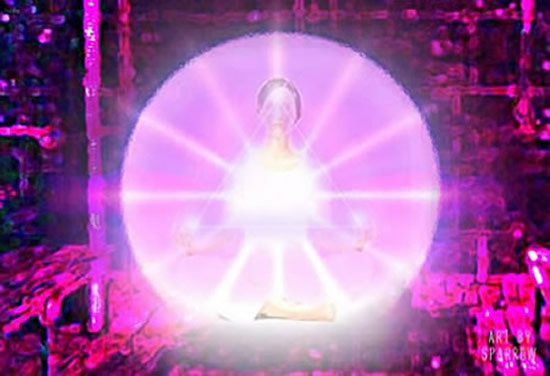 Focus now upon the exquisite energy contained within the violet plasmic sphere. Let it permeate through and penetrate your mind, body and soul. Feel every atom and molecule of your being saturate with this beautiful violet energy. Know that nothing negative can possibly enter this sphere without your permission. This sphere is now going to be used to access different dimensions in time and space. 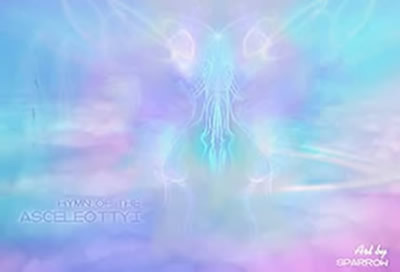 You invoke the name ‘Asceleottyi’ and call upon them to connect with you. As you look outward from within the sphere visualise the surroundings of your current room from memory. As you do this allow the sphere to alter your energy vibration. Visualise your body becoming a brilliant mirror of aluminous light. You are saturated in violet transformative light. Observe now how the surroundings outside of the sphere begin to change. Objects begin to lose their physical appearance and instead begin to appear as pixels of light. These pixels of light completely change the perspective of reality outside the sphere. You watch as a matrix of aluminous pixels replace physical space and you feel as if you are sitting within a hologram of your former reality. Now watch as even those pixels fade and saturate into nothingness. The whole room disappears, and yet you stay unmoved in your position within the sphere. You realise you are entering another dimensional frequency, and the physical laws of time and space no longer apply. Visualise yourself, within your sphere travelling at tremendous immeasurable speed through blurred corridors of light, sound and unusual imagery. Remembering you are completely safe and secure within your sphere. Visualise yourself travelling beyond stars and space at the speed of thought. Everything you see appears as streams of blurred images as you pass it effortlessly. Focus again on, and utter the name ‘Asceleottyi’. Allow the vibration of the word to propel you into motion. At last you come to an abrupt halt, yet you remain unmoved within the sphere. You find yourself in an infinite void of beautiful streaming light all moving in different directions. The light consists of colours you have never even seen before. As you focus your vision you appear to be in the middle of a vast expansive corridor, between dimensions. There are no walls, no doors, simply streams of radiant light directly above you, and directly below you. Beyond the streams of light above you, you occasionally glimpse flashes of stars, galaxies and other galactic phenomenon. Whereas, below you, you get glimpses of different planet landscapes and atmospheres. The sphere within which you sit now nestles upon a white disk of light that appears from under you. Allow yourself to sit comfortably and soak in the breathtaking visuals of this dimensional corridor. Suddenly, in the corner of your eye you catch an apparition of movement. It fades into view quickly and speeds effortlessly towards where you sit. Immediately you sense the unique energy from this being as it manifests to you in one of their native forms. Allow yourself to experience the energy and the love from this being as it begins to speak with you. It speaks to you telepathically in a language you can understand, although its form may be unusual to you. It speaks of its name and tells you that it has come to represent the Asceleottyi group. Rather than use telepathic English, the being may choose to manipulate and distort your surroundings to show you images instead. These images will be proudly insightful, emotionally provoking and awe-inspiring. It may leave these images open to your own interpretation. If you wish for healing at this time, ask this being to assist you at this time for whatever it is you feel needs to be healed. If you wish for guidance or insight at this time, ask this being to assist you at this time for guidance and insight. If you wish to access their vast knowledge and wisdom at this time, ask this being to assist you at this time for just that. The Asceleottyi will show you exactly what you need to see, or tell you exactly what you need to hear for that moment. When you are ready to return home, ask the Asceleottyi to take you home. Or if you are comfortable to do so, take yourself home back the way you came. It is very important that you ground yourself once you have returned back to physical awareness. You may want to write your experiences in your diary or journal afterwards.